The basic plot of DuBarry Was A Lady is as follows: Hat check man Louis Blore (Red Skelton) is in love with nightclub star May Daly. (Lucille Ball) May, however, is love with a poor dancer (Gene Kelly), but due to her parents’ poverty wants to marry for money. When Louis wins the Irish Sweepstakes, he asks May to marry him and she accepts even though she doesn’t love him. Soon after, Louis has an accident and gets slipped a doctored drink (meant for Gene Kelly), where he dreams that he s King Louis XV pursuing the infamous Madame Du Barry (Lucille Ball). In short, it s an MGM musical comedy, with some wonderfully funny moments with two of the screens great clowns, Red Skelton and Lucille Ball. Gene Kelly is also very good, as are Zero Mostel and Virginia O’Brien in comedic roles. 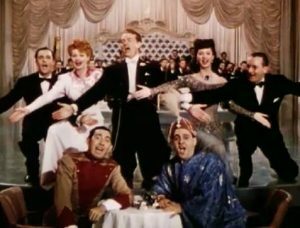 Many highlights to the film include Red Skelton doing a variation on his Guzzler’s Gin  routine, when he drinks a mickey finn  meant for Gene Kelly, which segues into a dream sequence set in old France, with Red Skelton as King Louis XV, Lucille Ball as Madame DuBarry, and Gene Kelly as the Black Arrow. Some wonderful Cole Porter songs including the classic Friendship , Madam, I Love your Crepes Suzette , Tommy Dorsey and his Orchestra (it is a musical, after all) and the comic interplay between the 3 main characters. If you’re interested in other Red Skelton musical comedies, be sure to check out Three Little Words starring Red Skelton and Fred Astaire, and Neptune s Daughter, starring Ricardo Montalban, Esther Williams, Red Skelton and Betty Garrett. Presented in glorious Technicolor, Du Barry Was a Lady is an all-singing, all-dancing musical extravaganza with enough star power to light a major city. Freely adapted from the Cole Porter musical that was a Broadway smash in 1939, this was Lucille Ball‘s first color film, and after several years of lower-profile movies at RKO, Lucy jumped at the chance to star in an MGM musical, assuming the role that Ethel Merman had played on Broadway. And while Lucy gets plenty of screen time to strut her stuff as the sassy and lovelorn nightclub singer May Daly, the real star of the show is Red Skelton as hat-check boy Louis Blore (played by Bert Lahr on Broadway), whose affection for May is matched by Alec Howe (Gene Kelly), a struggling songwriter with whom May — against her gold-digger instincts — has reluctantly fallen in love. But when newly-rich sweepstakes winner Louis accidentally drinks a Mickey Finn  intended for Alec, he passes out and dreams of being France s King Louis XV, living in royal splendor and running after the lovely Madame Du Barry (Ball) in the palace at Versailles. It’s a comedic spin on The Wizard of Oz, with the contemporary characters (including Zero Mostel in a wacky supporting role) playing their 18th-century counterparts. King Louis XV (Red Skelton): [singing] Tra-la-la-la-la-la-la-la you ve come to wash my face! Maids: [singing in return] Tra-la-la-la-la-la-la-la we ve come to wash your face! Alec Howe (Gene Kelly): [about May Daly] Isn’t she wonderful? Taliostra (Zero Mostel): What’s so wonderful about her? Take away her eyes, her nose, her lips, and what have you got? A blank expression. Alec Howe (Gene Kelly): You’re human aren t you? May Daly (Lucille Ball): I hope not! Louis Blore (Red Skelton): Will nothing come of our beautiful friendship? Ginny (Virginia O’Brien): Not if I have anything to say about it! Ginny (Virginia O’Brien): Can’t you see I love you and want you for the father of my children? Louis Blore (Red Skelton): I didn t know you had any! Louis Blore (Red Skelton): My boarding house is so crowded, we have to take showers piggy back. Louis Blore (Red Skelton): You remind me of one of those girls in Esquire, the ones with clothes on, of course. Old lady: Next time I get hitched it’s for dough. Louis Blore (Red Skelton): Why is it the rich people have all the money? Louis Blore (Red Skelton): My whole life I’ve been kind to dumb animals, but this is the first time a dumb animal’s been kind to me! Louis Blore (Red Skelton): Are you wearing my old suit? It’s too small for you, isn’t it? Charlie (Rags Ragland): Nah, I’m just too far into it. Louis Blore (Red Skelton): Money ain’t changed me, I m still lovable! Charlie (Rags Ragland): Hey, Slim! Watch your hat? Watch your derby? May Daly (Lucille Ball): I see you want to buy me. Louis Blore (Red Skelton): Gosh no, Miss Daly, I want to marry you! Louis Blore (Red Skelton): Hey everybody, guess what? May’s getting married! To me! Louis Blore (Red Skelton): Don’t talk to May like that, or I’ll slug you! Alec Howe (Gene Kelly): Oh, yeah? Louis Blore (Red Skelton): And there’s plenty more where that came from! Louis Blore (Red Skelton): She s just excited. She s never married before. Charlie (Rags Ragland): We ll slip him a Rooney. Louis Blore (Red Skelton): A Rooney? What s that? Charlie (Rags Ragland): It s a high-powered Mickey. Louis Blore (Red Skelton): Here’s to I, May, and you – the eternal rectangle. If this was back in the glorious days of France, I would be King Louis, May would be Du Barry, and you would be one of the common folks – a peasant. King Louis XV (Red Skelton): Hey! Men don’t kiss men! Dauphin (Rags Ragland): They do in France, Pop. King Louis XV (Red Skelton): What s this? Duc de Rigor: Your breakfast, Sire. King Louis XV (Red Skelton): Well, who eats who? King Louis XV (Red Skelton): What’s the setup around here, am I really the King? Dauphin (Rags Ragland): Anyone who says you ain’t, dies. King Louis XV (Red Skelton): Don t you know that kings can do no wrong? Madame Du Barry (Lucille Ball): That s my plan! 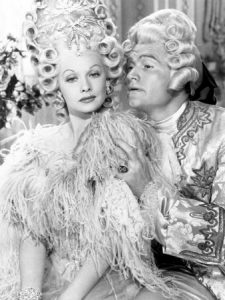 Madame Du Barry (Lucille Ball): He s mad about me! Ginny (Virginia O’Brien): They re all mad, about you! Duc de Rigor: Who dares to interfere? King Louis XV (Red Skelton): Me! My Majesty! Black Arrow (Gene Kelly): Be brave, my friend, you’re dying for your country. Taliostra: (Zero Mostel): Yeah, but I was born in the city! Dauphin (Rags Ragland): Get your Daily Chopping Guide! You can t tell which head is which without a program! Charlie (Rags Ragland): That s OK, he s snapping back to abnormal now. Ginny (Virginia O’Brien): You never look at me like that. Louis Blore (Red Skelton): You never look like that. Alec Howe (Gene Kelly): You know, it s too bad May couldn t marry for love and money. Louis Blore (Red Skelton): You mean sort of a double wedding? Black Arrow (Gene Kelly): How embarrassing, to be found hiding behind a woman’s skirts. Black Arrow (Gene Kelly): Du Barry! That jay! That Jezebel! That spoiler of kings! 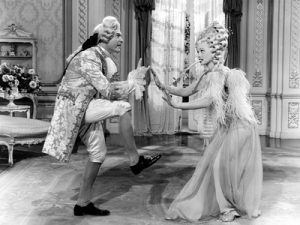 Madame Du Barry (Lucille Ball): Isn t he wonderful? Black Arrow (Gene Kelly): Does she love the king? No! She loves rubies! So your children go hungry! She loves silks! So your wives go naked! Madame Du Barry (Lucille Ball): [dreamily] Look at his eyes. King Louis XV (Red Skelton): We ll give him a fair trial. Then we ll hang him. King Louis XV (Red Skelton): For parading without a license each of you gets thirty days. For planning to knock me off, you get the guillotine.